This site is the repository for the archives of RMST221 (AY2009-10/Wt2). Everything that was previously at RMST221 at UBC Blogs has been copied over to this present mirror-version. Meanwhile, RMST221 at UBC Blogs will morph into its 2010 incarnation shortly before the beginning of term (Tuesday 7 September), and will be used (with a new password for certain parts) solely for the current academic year’s version of the course. On this archive site: you will find everything that was on the UBC Blogs site, including all of your (i.e. 2009 students’) contributions to discussion and commentary on the blog proper. Most of the posts (and all student comments) are password-protected (except for the present one, the one immediately below it, and most of the items in the Course menu to your right). Only participants in the course know this password. Before the Age of Enlightenment, intersecting with the Age of Discovery: the Age of Adventure. 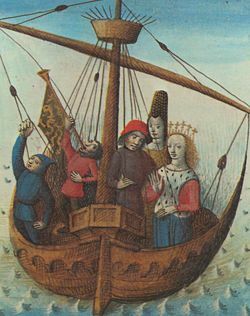 The Middle Ages and Renaissance offer us some of the most exciting and experimental writing about adventures, adventurers, and adventuring. Journeys of discovery pursue physical, spiritual, amorous, and literary quests. We will explore issues of translation, kinds of writing, rewriting, and refashioning; considering ideas of innovation and novelty, from “romance” through to the “novel.” Readings also include travel narrative, short stories and their collection, parody, and the picaresque, so as to follow different approaches to adventuring, from the late twelfth century up to the early seventeenth. New to the site and the course? First, read Outline & syllabus (the first item in the Course menu to your right). Protected: REVIEW SESSION AND A.O.B.